Robert L. "Bob" Jones K5HCM was born November 6, 1940 in Golden Meadow, LA, died January 7, 2008 in Atlanta, TX. Bob was the founder of the Radio Amateurs of Cass County. 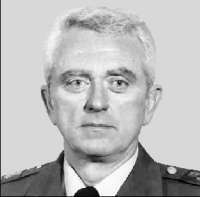 Bob was a retired Brigadier General with the Texas Army National Guard, was inducted into the Texas National Guard Hall of Fame, and served as commander of the Atlanta Guard Unit and later commanded a tank battlion and was also retired from Day and Zimmerman. He was a member of Open Door Baptist Church and was a member of Gideons International. He enjoyed flying his plane, fishing and amateur radio. He loved spending time with his family and attending school functions with his four grandsons.